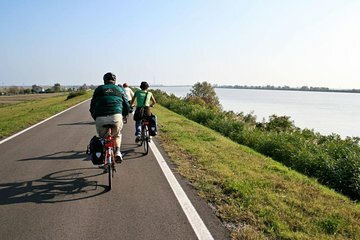 Take a leisurely bike tour through the Itria Valley in Puglia with stops for tastings of delicious local foods and wine. Learn about regional traditions as you ride through the countryside with an expert guide who shares the best of this enchanting region in southern Italy. In the morning, make your own way to I Pastini winery, located in Locorotondo. Placed on a hilltop on the Murge Plateau, Locorotondo is a picturesque village with a pedestrianized historic center that is lined with white buildings. It has been designated 'I Borghi piu Belli d’Italia' – one of the most beautiful towns in Italy. Your guide provides you with a bike, helmet, and safety briefing, then leads the way through the countryside of the Itria Valley. See old vineyards, historic Masseria farmhouses, and small villages that show the essence of the Itria Valley, which is known for its wine producers and mozzarella. Expect to take an easy 7-mile (10-km) route that is 90% paved track. The trail follows small secondary roads and cattle tracks that are ideal for leisurely cycling. A wine tasting accompanied by local food specialties tops off this memorable morning tour.